“Our Montessori community wants our children to reach for their full potential, by encouraging a lifelong love of learning, through respect for others and our environment and by enabling them to grow in confidence and independence”. The classrooms are situated within Howick Primary School. The school has very good facilities, is well resourced and has one of the largest playing grounds in Auckland. Howick Primary School is forward thinking in its leadership, is child-focused, and values the Montessori classrooms. 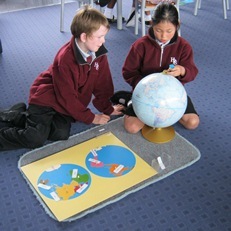 Our classrooms provide Montessori education within the framework of the New Zealand Curriculum. Our spacious classrooms are exceptionally well-resourced with Montessori materials and offer a safe and friendly learning environment for all children. The classrooms are fully integrated into Howick Primary School so students also participate in school wide activities, sports, cultural and arts programmes. Through the Montessori philosophy, our teachers nurture the development of the whole child. The children work, learn and progress at their own pace and benefit from individualised learning plans. Our teachers work with the children (6 – 9 and 9 – 11 year old groupings), responding to individual learning styles, fostering responsibility and initiative. There is a strong emphasis on providing a peaceful and orderly environment which enhances the children’s ability to learn. The children look after their classroom, vegetable gardens, class pets, and have opportunities for learning outside the classroom. Our teachers hold Montessori qualifications, are experienced NZ registered teachers, and continue to develop their professional skills each year. Our school was fortunate to be selected for the Montessori Journey to Excellence Pilot Programme in 2013-14 facilitated by Montessori Aotearoa New Zealand and Massey University. The Montessori children at Howick Primary are not seen as different in the playground, and have friends throughout the wider school. They are actively involved and well represented in all wider school activities, including sports, cultural groups and leadership opportunities. The wider school and the principal are incredibly supportive of the Montessori classes and philosophy. There is a strong and successful collaboration between the teachers, the principal, the Howick Primary School Board of Trustees, and the Montessori parent committee. Parents are actively involved, and enjoy the family atmosphere of the school. There is lots of opportunity for your family to take part in school activities. Many parents are involved on the school Board of Trustees and PTA. Places in the Montessori unit are limited and applications for enrolment will be assessed in a fair and equitable way at all times, taking our criteria into consideration. Fill out a ‘Registration of Interest’ form. Do this when your child starts Montessori preschool. Fill out an ‘Enrolment Application’ by the time your child is four years old. Attend an informal meeting when your child is four-and-half years old. ** An enrolment application is not an acceptance of the enrolment. Contact us or visit our website for our school prospectus, full enrolment details, forms and criteria.